The Pressure Demand SAR with Escape Cylinder (Hip-Pac) offers the same reliable facepieces and second stage regulators as the Cougar and 1997-style Panther SCBAs. 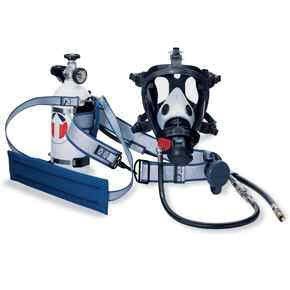 It allows the user to comfortably wear the respirator to enter an IDLH environment while breathing from a remote air source. Should the air supply be interrupted, the user can switch to the cylinder for escape. The escape cylinder is available in 5-, 10- and 15-minute durations. 5-minute escape cylinder (2216 psig, aluminum), with second stage quick-disconnect, no coupling. TwentyTwenty Plus facepiece—medium, black, medium nose cup, silicone headstrap. Other facepiece and nose cup sizes available. Headnet available. Puma hood available. NIOSH TC-13F-300. 5-minute escape cylinder (2216 psig, aluminum), without second stage quick-disconnect, no coupling. TwentyTwenty Plus facepiece—medium, black, medium nose cup, silicone headstrap. Other facepiece and nose cup sizes available. Headnet available. Puma hood available. NIOSH TC-13F-300. 10-minute escape cylinder (3000 psig, aluminum), with second stage quick-disconnect, no coupling. TwentyTwenty Plus facepiece—medium, black, medium nose cup, silicone headstrap. Other facepiece and nose cup sizes available. Headnet available. Puma hood available. NIOSH TC-13F-300. 10-minute escape cylinder (3000 psig, aluminum), without second stage quick-disconnect, no coupling. TwentyTwenty Plus facepiece—medium, black, medium nose cup, silicone headstrap. Other facepiece and nose cup sizes available. Headnet available. Puma hood available. NIOSH TC-13F-300. 10-minute escape cylinder (4500 psig, carbon), with second stage quick-disconnect, no coupling. TwentyTwenty Plus facepiece—medium, black, medium nose cup, silicone headstrap. Other facepiece and nose cup sizes available. Headnet available. Puma hood available. NIOSH TC-13F-482. 15-minute escape cylinder (3000 psig, hoop-wrapped fiberglass), with second stage quick-disconnect, no coupling. TwentyTwenty Plus facepiece—medium, black, medium nose cup, silicone headstrap. Other facepiece and nose cup sizes available. Headnet available. Puma hood available. NIOSH TC-13F-300.